You can make a new, empty folder and add buttons to it in Edit Mode. Go inside the folder where you want the button that opens your new folder to be. Tap Edit in the bottom toolbar. Select any empty grid space. Depending on your grid size, this may be split in two. If it is, choose the Add Folder section on the right. Otherwise, choose Add Folder from the popup, then select New Folder. Proloquo2Go will ask you to choose a template for your folder. You can choose any template by tapping its name. On iPad, you will see a preview of your selected template. You can also scroll down to the bottom and select No Template. Tap Next to continue. Type a name for your folder. Your folder cannot have the same name as any other folder in the user’s vocabulary. Choose whether to open the folder in a popup. If you selected No Template, you can also choose to turn on Manual Layout for Each Grid Size. In most cases, you will not need to do this. Select Done to finish making your folder. Double-tap the folder’s button in the grid to open it. You can now add buttons to the folder. For step-by-step instructions, see Add a button. When you are done making your folder and adding buttons, tap Done in the top right corner of the screen to exit Edit Mode. 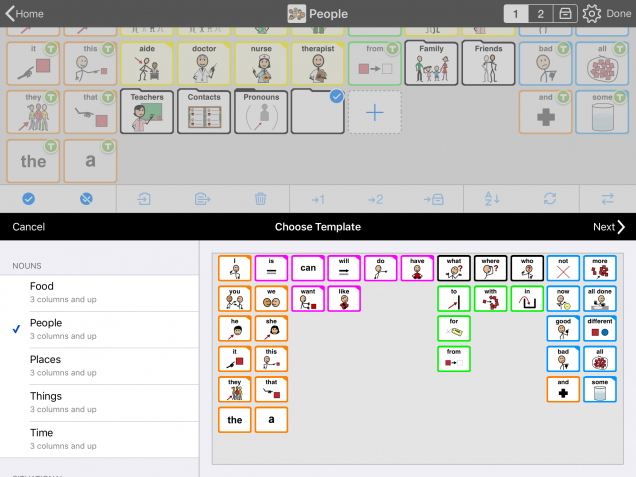 Consider ways to teach combining words and grammar to AAC users who are ready.